The unique quiet of each seasonal presence witnessed on the surface of sturdy vessels. Nature’s uncontrolled atmospheres interpreted through atmospheric kilns in the control of practiced hands. The ambiguity of barriers and thresholds are collaged in layers. They create visual surface tension upon the material tension below. Above or below. Front or back. In or Out. Isolation or inclusion. The delight invoked by paper cut silhouettes. A candy shop of kitschy function. Frivolous whimsy is betrayed by the endless pattern of remembered touch. The absorption of a culture once assumed familiar, now distant in the reexamined reality. Sieved through stylization, reality is re-digested. Collaborative caricatures are created and they re-direct our gaze. Making art is just another language for discussing our human experience in the world. Each year residency communities are opened to the opportunity of experiencing new languages and paradigms. Another residency season is coming to a close at Red Lodge Clay Center and we have come to understand each residents’ particular language a little better in the past eleven months. Karin Solberg is committed to her studio philosophy in every action of her life. 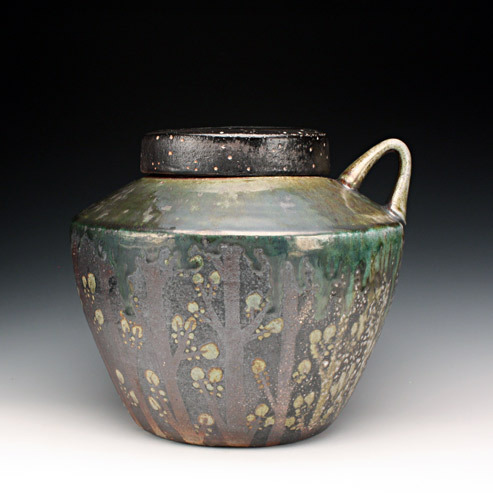 Megan Mitchell displays the same quiet assured purposefulness in her pots as she does in her character. Brittany Faye Helms is a young light with a steeled foundation of direction. Alexis Gregg and Tanner Coleman present the joy they take in every culture they experience and give us gifts, which exude collaborative cooperation, rarely lingering in the toil such ventures exert. You are witness to four distinct languages in this exhibition and we hope you will be engaged enough to continue the conversation with these makers as they move forward in their careers. Gregg and Coleman will go on to a symposium in Turkey and then to a residency in China. Mitchell will be a Fellow at Marlboro College in Vermont. Solberg will teach at MSU Billings this fall, and Helms will begin her MFA at The Ohio State University. We thank each of them for sharing a piece of their journey with our Red Lodge community.